Gmail Backup Tool which can widely used to make Gmail backup into your local computer hard drive. Its resolve this issue with a Gmail backup software will help users to instantly restore Gmail multiple accounts, backup save it in PST,EML,MSG or MBOX file formats and save the whole Gmail email to a local hard drive productively. Tool takes backup of Emails, Contacts, Documents from Gmail Account. Supports Backup of single and multiple users accounts. Takes a backup from Multiple Gmail Accounts at a time. Provides pause & resume option during the backup taking process. Software provides option to take backup of only selected items. Backup & Restore All Gmail Folders. Convert Gmail Emails to PST, MBOX, MSG & EML File. Download Gmail data folder wise, option to Select all folder or Select particular folder. There are a plenty of reasons, which impose users with the need to back up their Gmail account. Following are some of the major conditions in which a backup works out as the best solution for escaping its consequences. Account Unavailability: Gmail users are habitual of receiving errors of server downtime appear on their screen at times when logging in. This happens when the Google server storing your account is under planned or unplanned downtime condition. This happens either when the server is under maintenance or crash conditions respectively. Hacking/Identity Theft: Cyber criminals are on the rise these days, which has led to a number of web-based crimes taking place these days. Hacking into a user's account is one of the most common misdeeds performed the intruders. Gmail being the most common email account owned by users worldwide is also the vulnerable to such attacks, which makes keeping data on server a threat. Gmail Backup is the necessitated solution for dealing with such conditions beforehand. Keeping a backup copy of your important emails on the machine frees you from the necessity of keeping it on Google Server. Thus, once you are free from the obligation, it is very much possible to avoid not being able to access the messages or losing them to an unauthorized user. Gmail Backup tool is a great utility bridging this gap for the account holders with a number of great features like; delete after download, internet bandwidth control, desired backup output type, filtered backup, and more. The software can create backup from multiple gmail account? Yes, you can easily create backup from multiple A/c, but the software requires correct user_name and password. Can I convert gmail backup into MS Outlook PST file format? Yes, you can covert gmail backup file into PST format, and you can also save a gmail file into three formats. I want to create selected gmail item backup it is possible with this software? Yes, you can create selective gmail item backup like Email, Contact, Calendar, etc. 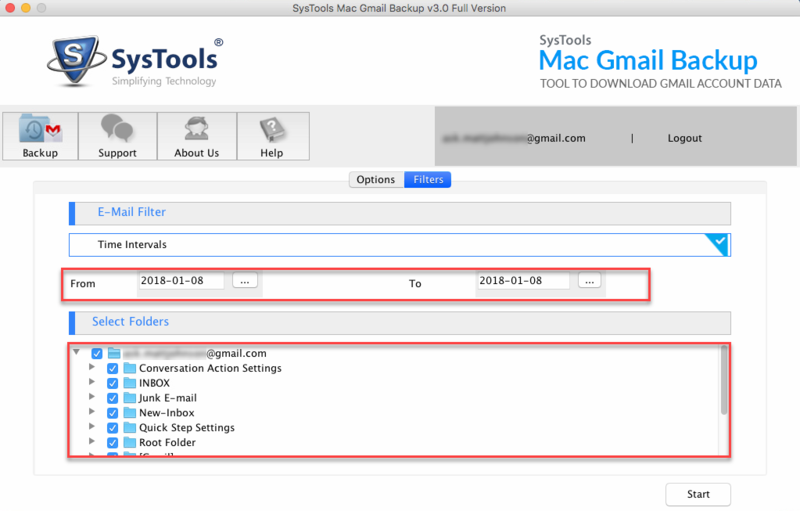 Mac Gmail Backup utilizes full sync mode for backing up the mailboxes of Gmail account in a unique directory. Inbox, Outbox, and other Gmail mailbox folders are archived on Apple laptop in just few clicks. The data integrity will be maintained throughout the backup procedure. Each messages with their attachments are backed up automatically with this application. 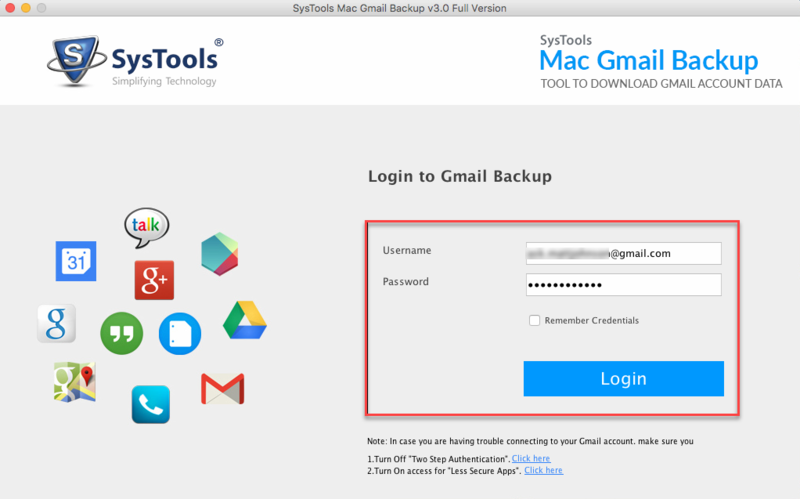 Users can download and utilize the demo version of Mac Gmail Backup for free. It enables users to export only first 100 emails to be exported in EML, EMLX, MBOX, MSG, and PST file format. To overcome this limitation, one can buy the product and opt for the licensed version. Users are benefited with option to eliminate the unwanted items at the time of backup procedure. The software provides date filtering feature to backup emails of certain time duration, which is mentioned in To – to – From range. Along with this, users are also provided with folder-wise filtering option for exporting data of particular Gmail folder only. The Mac Gmail backup tool provides a useful option of deleting data from the server, just after downloading it. Users need to activate this feature before initiating the actual backup using the tool. No external operations are required to execute this functionality in the product. The software does not require Microsoft Outlook or any other email client for its supportive working. Does the software supports backup creation of multiple account within it? No, at one time, the Mac Gmail backup supports processing of one account to backup the data. What time duration is required by the tool to complete the entire backup procedure? The overall time needed to complete the backup process is dependent upon the amount of data to be backed up. Also, the internet speed is one factor for the backup procedure. 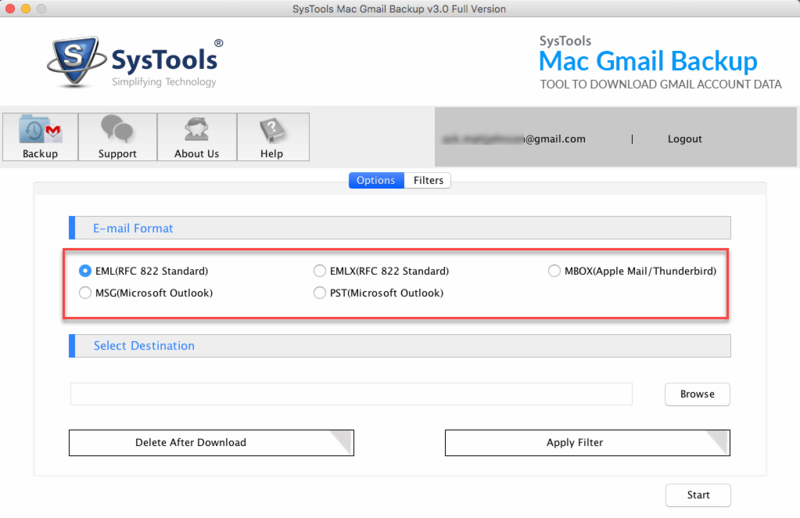 Alike your Windows Gmail backup tool, will this Mac Gmail backup require any supportive program for its working? No, this application does not requires any desktop-based email client for its working. In a complete independent manner, you will be able to take backup of Gmail backup on Mac OS X. "It is true that several software development firms exists in the internet market but, yours is the best. Specially talking about the Mac Gmail backup tool then, it is the amazing product that I have ever encountered. Thank you guys!"